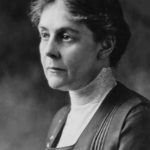 Alice Hamilton was born in New York City. She was a physician and a leading authority on lead poisoning. Her work led to improved safety standards nationwide. In tribute to her work, the National Institute for Occupational Safety and Health presents an award in her name to scientists and engineers who excel in the field. Throughout her career, she focused on industrial diseases and became a special investigator for the US Bureau of Labor in 1911. She was the first female professor of public health at Harvard University. "When I talked to my medical friends about the strange silence on this subject in American medical magazines and textbooks, I gained the impression that here was a subject tainted with Socialism or with feminine sentimentality for the poor." "Every article I wrote in those days, every speech I made, is full of pleading for the recognition of lead poisoning as a real and serious medical problem."